How to Make Next Christmas the Best Ever..
How would you like an extra £250 for Christmas next year? And the year after that? And the year after that? And the.. Well, you get the idea. HECAS are proud suppliers of the award-winning Combisave system, which continues to grow in popularity as its many benefits are discovered, enjoyed and appreciated by more and more people. A thermostat-operated valve designed to control water flow during a boiler’s startup firing process, the Combisave thermostatic control valve can be retrofitted to almost any new or existing wall-hung combi-boiler system and will save you lots of lovely £££s so check out the facts and figures below! It has been shown in independent tests (carried out by EA technology) that when a boiler is switched on, approximately the first ten litres of water are wasted as the system heats, resulting in the burning of excess gas. This fact is true even of brand-new, A-rated boilers and the Combisave device seeks to effectively solve the problem by reducing water flow until a set temperature has been reached, at which point only will the valve fully open to allow hot water to flow freely around the system. 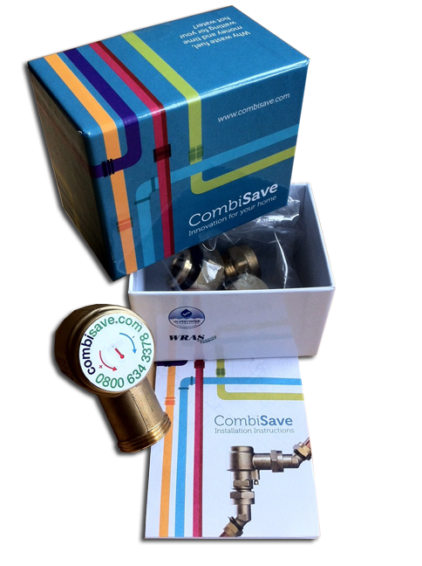 Incredibly well-respected, the Combisave was the overall winner at the UK Energy Innovation Awards 2010 and comes endorsed and recommended by Waterwise, the UK’s and Europe’s leading authority on water efficiency since 2005. Before installation, the average boiler takes 49 seconds to reach maximum water temperature, burning 400w of gas and using 8.5l of water in the process. Compare this to the streamlined figures after installation of Combisave - 20 seconds to start with just 166w of gas and 2 litres of water used. The Combisave thermostatic control valve is fabricated from tough, lasting brass with added de-zincification qualities. Fitted with a pair of easily-rotated elbows, the unit can be easily fitted to most standard pipe configurations and is supplied with a clear fitting guide along with the necessary olives and nuts required for a safe, professional and robust ‘fit-and-forget’ result. Is the Combisave thermostatic control valve suited to your system? Call our expert team to find out and you could soon be £250 a year richer!